Empanadas, two ways: potato + soyrizo & roasted sweet corn + crab — potato chips are not dinner. I thought I hated empanadas up until a few years ago. 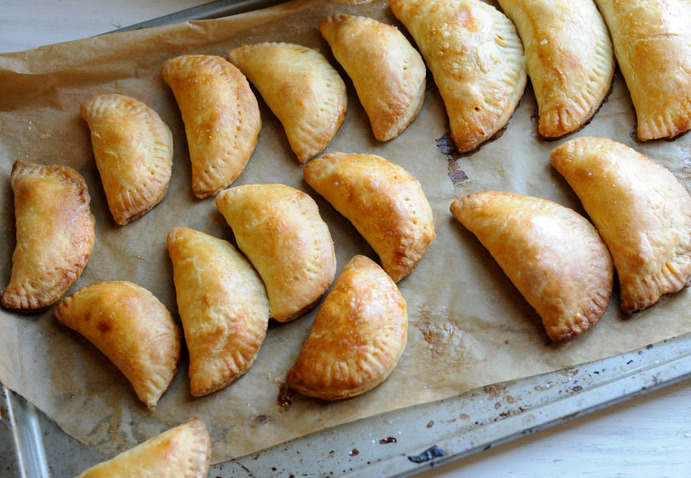 Growing up, you could find a plethora of empanadas at pretty much every big Filipino gathering. I would hesitatingly put a couple on my plate, break them in half, and then secretly pick out every. single. raisin. I wasn't the only one. I know raisins and meat are a pretty traditional empanada filling, but it just isn't my thing. I recently went to Cabo San Lucas, and upon return I knew I wanted to have a casual little dinner party .I absolutely love feeding people and sparking good conversation with delicious food. I wanted to step outside the box....er, tortilla...so I thought I'd try my hand at empanadas. RAISIN FREE EMPANADAS, The pastry shell is perfectly flaky and buttery, which goes well with both the spicy potato filling and the more subtle and sweet crab and corn filling. Dipped into plenty of Mexican Crema, they were perfect. Nobody could stop at just one. These make a perfect appetizer or even main as long as you have plenty of other small eats, as they are pretty filling. I can't wait to try my hand at sweet empanadas sometime. Cut butter into small 1/4 inch cubes and chill in the freezer for 15-20 minutes before preparing dough. Sift flour with salt intoa bowl and cut in butter using a pastry cutter or your hands until mixture is coarse. Some larger lumps of butter are ok. Whisk together egg, water, and vinegar in a small bowl Add to flour mixture, stirring with until it just comes together and you have a shaggy mixture. Lightly flour your surface and knead dough until it forms a ball (just a couple of times). Flatten dough into a large rectangle, and cover very well with plastic wrap (you don't want your dough to develop a hard "skin" around the edges!) Refrigerate for at least an hour. You may keep this chilled overnight but I wouldn't go any longer than that. Cut potatoes into very small cubes, and boil them until tender, about 20 minutes. Drizzle corn with 1 tsp. olive oil and roast in the oven until deep golden brown, about 25 minutes. When cool, slice kernels off. Mix corn in with 16 ounces lump crab meat, minced garlic, diced onions, diced bell peppers, and green onion. On a lightly floured surface, and with a lightly floured rolling pin, roll out dough to 1/8th inch thick. Using a 3 inch cookie cutter, cut round circles into your dough. 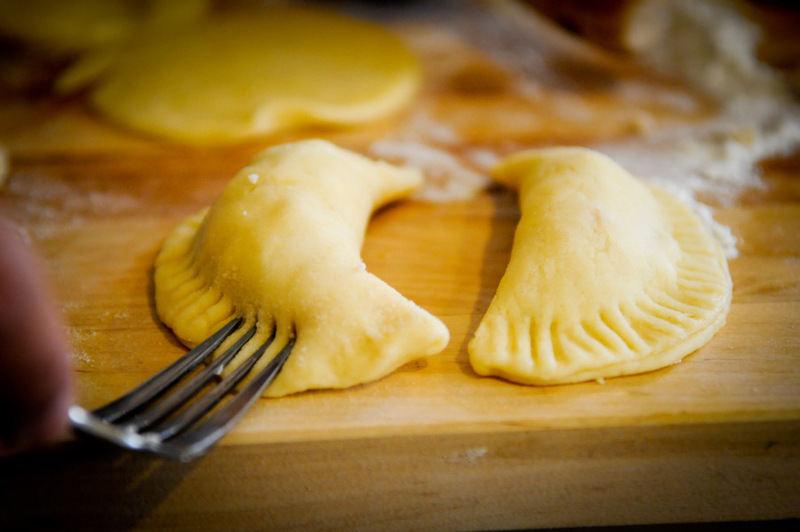 Spoon a heaping tablespoon into the center of each of your empanada dough disks. Fold dough disc in half, press together edges, and crimp with a fork to seal. Bake for 20 minutes, until golden brown. Alternating between the top rack and the lower rack of the oven for 10 minutes each. 1. Prepare your empanada dough: cut butter into small 1/4 inch cubes and chill in the freezer for 15-20 minutes before preparing dough. Sift flour with salt intoa bowl and cut in butter using a pastry cutter or your hands until mixture is coarse. Some larger lumps of butter are ok. Whisk together egg, water, and vinegar in a small bowl Add to flour mixture, stirring with until it just comes together and you have a shaggy mixture. Lightly flour your surface and knead dough until it forms a ball (just a couple of times). Flatten dough into a large rectangle, and cover very well with plastic wrap (you don't want your dough to develop a hard "skin" around the edges!) Refrigerate for at least an hour. You may keep this chilled overnight but I wouldn't go any longer than that. 3. On a lightly floured surface, and with a lightly floured rolling pin, roll out dough to 1/8th inch thick. Using a 3 inch cookie cutter, cut round circles into your dough. 4. 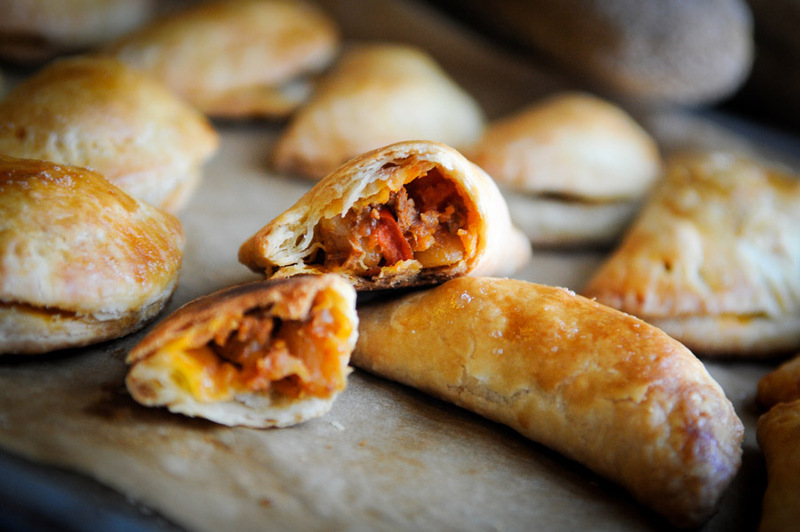 Spoon a heaping tablespoon into the center of each of your empanada dough disks. 5. Fold dough disc in half, press together edges, and crimp with a fork to seal. 7. Bake for 20 minutes, until golden brown. Alternating between the top rack and the lower rack of the oven for 10 minutes each.